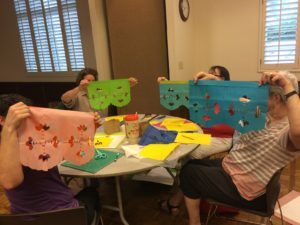 Mini Workshops (“Minis”) are a fun and informal activity that is open to all. These workshops are hands-on. Topics may include specific calligraphic instruction or small, take-home art or craft projects. Minis are an inexpensive and fun way to learn from others regardless of your current skill level. View the highlights from our some of our past Mini Workshops! “Minis” begin promptly at 7:00 p.m. and end at approximately 9:00 p.m. Doors are opened by 6:30. Please arrive early to set up. Fees for Mini Workshops are $5.00 for members and $6.00 for non-members. Fees must be paid before the workshop begins by contacting the Mini Workshop Chairperson by email or at any regular monthly meeting. Alternatively, members may pay with a single payment of $40.00 for all mini-workshops at the beginning of the program year. At the time of payment, you will receive a receipt. Bring your receipt to the workshop in case there are any questions regarding payment. You may be able to pay at the door, however, you must arrive early and keep in mind that seating is limited to those who have paid previously. Checks should be made payable to SACG. Please note “mini workshops” on the check. Anyone attending Mini Workshops (including Instructors’ Assistants) are required to pay the workshop fee. Mini Workshop fees are non-refundable. The size of each workshop may be limited at the discretion of the Instructor or the Mini Workshop Chair. The Mini Workshop Chair will provide a sign-in sheet for recordkeeping purposes. Participants may be requested to bring basic supplies. See our basic supply list for additional information.